The USDA recommends that people fill at least half their plates at each meal with vegetables and fruit. For some, that might seem like a challenge. But there’s more than one way to devour the heaping daily portions of produce. You could, of course, chop your veggies and eat them fresh or season and sauté them. Or you can join the trendy crowd and drink them blended together into a liquid salad or transformed into a creamy, lime-colored smoothie with a little coconut milk and almond butter. The best way to get nutrition is from food, and by consuming a healthful smoothie every day you are getting most of your nutrition in one proven delicious drink. 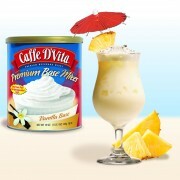 And with Caffe D’Vita Vanilla Base Smoothie mix you can make healthy, inexpensive green smoothies. Thick green smoothies and their transparent green counterpart, the green juice have become a fashionable way to consume big doses of veggies thanks to endorsements by celebrities such as heart surgeon and talk-show host Dr. Mehmet Oz and the popularity of greens such as kale and spinach, which are the reason that most green smoothies have shades ranging from moss to forest. They typically contain kale or spinach, sweet fruit or a vegetable with a high natural sugar content such as carrots or beets, or their juice and some kind of liquid, usually apple juice or pineapple. Spinach is a better vegetable to begin with than kale because it’s sweeter and is almost nutritionally equal to kale. 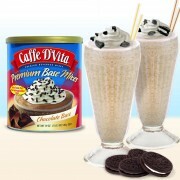 Once people try these, they realize how good they are. And then, the more a person drinks them, the more they enjoy them. Green smoothies are loaded with vitamins and minerals, just like the fruits and veggies that go into them. Green smoothies can be a healthy choice for many people, and if sipped slowly they are a replacement for soda or other non-nutritious snacks. It tastes like you’re just drinking a salad only better.